The ACC received nine bids to the NCAA Tournament today — the same number as a year ago — and is well-represented at the top of the bracket. 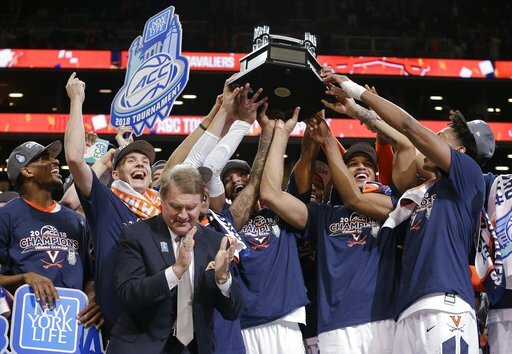 Virginia rode its superb regular season and ACC Tournament championship all the way to the top of the field as the NCAA Tourney’s #1 overall seed. Tobacco road rivals North Carolina and Duke each landed on the #2 seed line with the Tar Heels earning the preferred Charlotte pod for the first weekend. Some late bid-stealers (Davidson and San Diego State, notably) burst the bubble for two ACC teams — Louisville and Notre Dame didn’t make the cut — but Syracuse somehow squeaked into the field. 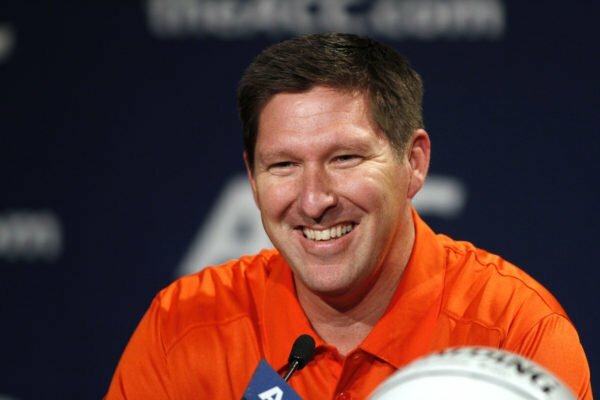 Here are some quick best- and worst-case scenarios for each of the nine ACC teams in this year’s field. Best Case: The Cavaliers ride the nation’s top defense all the way to San Antonio, giving Tony Bennett his first Final Four appearance and a shot at the school’s first-ever National Championship. Worst Case: Virginia’s offense bogs down against a team that has enough NBA-level talent to make shots against the pack-line defense. Both Arizona and Kentucky fit that description, and one of them will likely play the Cavaliers in the Sweet Sixteen. Best Case: Joel Berry turns into Mr. March again, leading the veteran Tar Heels back to the Final Four for the third consecutive year. Worst Case: The threes don’t connect for North Carolina and they can’t get enough stops against a hot Michigan squad in the Sweet Sixteen. Best Case: Duke plays to its potential on offense and opponents continue to struggle against the Blue Devils’ zone defense, giving Coach K a chance to win his sixth National Championship. Worst Case: Duke’s prize freshmen succumb to postseason pressure, and once again, a talented Blue Devil team underachieves in the Big Dance — perhaps as early as the Second Round. Best Case: Clemson’s experience in so many close ACC games enables the Tigers to reach the Sweet Sixteen for just the third time in school history. Worst Case: After a six-year NCAA Tournament drought, the Tigers play tight as a higher-seeded team and get picked off in their opener by a solid New Mexico State squad. Best Case: The Hurricanes make enough shots and continue their close game acumen, upsetting Tennessee in the Second Round and advancing to Atlanta. Worst Case: Miami doesn’t have enough firepower to get past a very tough squad from Loyola-Chicago in the opener. The Ramblers (KenPom #41) are rated very similarly to the Hurricanes (#36) in advanced metrics. Best Case: Virginia Tech upsets #1 seed Villanova in the Second Round with a barrage of three-pointers to advance to the Sweet Sixteen. The Hokies should be confident in such a match-up based on their wins over Virginia, North Carolina and Duke during the regular season. Worst Case: The smaller Hokies get beat up in the paint and fall in their opener to a a very talented Alabama team that has eight wins against KenPom top-50 teams. Best Case: In a repeat performance from 2015, the Wolfpack win a squeaker in the First Round and then upsets #1 Seed Kansas — just as they did to Villanova three years ago — to advance to the Sweet Sixteen in Kevin Keatts‘ first year at the helm. Worst Case: NC State can’t make enough threes to overcome its porous defense against a veteran, battle-tested Seton Hall squad in the First Round. Best Case: Xavier has shown a tendency to keep inferior opponents close, which is right in Leonard Hamilton’s wheelhouse. The Seminoles have pulled out seemingly a million one-possession games in the last few years so they may be able to pick off the top-seeded Musketeers. Worst Case: Florida State once again comes out flat in a game away from Tallahassee and goes down to Missouri for yet another early exit from the Big Dance. Best Case: With Michigan State looming in the Second Round, the Orange’s ceiling appears to be a win in Dayton followed by an upset over TCU. Worst Case: Syracuse often struggles to score, which could be problematic against an Arizona State squad that has plenty of offensive firepower. This entry was posted on Sunday, March 11th, 2018 at 5:59 pm by Brad Jenkins (@bradjenk)	and is filed under acc, feature, microsites. Tagged: acc, clemson, duke, florida state, louisville, miami, nc state, ncaa tournament, north carolina, north carolina state, notre dame, virginia, virginia tech. You can follow any responses to this entry through the RSS 2.0 feed. You can leave a response, or trackback from your own site.